The official launch date of a new weekly freesheet set to be Britain’s biggest weekly has been revealed. 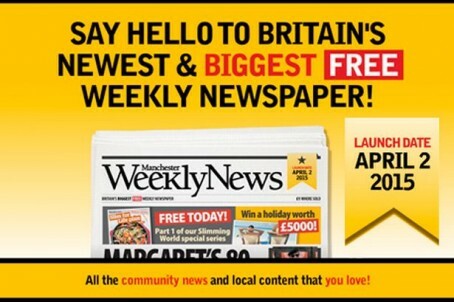 The first edition of the Manchester Weekly News will hit the streets on 2 April – to replace the Stockport Times, Wilmslow Express and the Advertiser series in Tameside, Salford, Oldham and Trafford. Nine jobs are set to go as a result of the changes, although new digital roles being created by publisher Trinity Mirror means there will be no net loss of jobs overall. The new title will be localised into eight editions – Salford, Tameside & Oldham, Stockport East, Stockport West, South Manchester, Sale & Altrincham, Stretford & Urmston, and Wilmslow. Editor in chief Rob Irvine said: “The new Manchester Weekly News will be a great addition to our portfolio, offering an excellent service of local news and opinion and supporting the Manchester Evening News and our website. The paper will be delivered to around 265,000 homes across Manchester and the surrounding area in place of the existing titles, which will publish their final editions next week. It will serve as a sister title to the Manchester Evening News and its companion website. I wonder if all these areas will have the same coverage? Publishers need papers to publicise their web sites otherwise people will forget them. How is that for irony when digital is supposed to rule? What will happen is that fully editionalised weekly papers will become partly editionalised – I don’t see how the readers will benefit that mutch. As Rob Irvine knows only too well, this is a cost-cutting measure from the MEN a paper who it must be said has produced some terrific content over the past twelve months. Is this the old Metro News with four zones reborn?